FINE GAEL’S CHANCES of being re-elected to government have taken a further blow tonight with the party dropping to 26% in the latest Red C opinion poll. 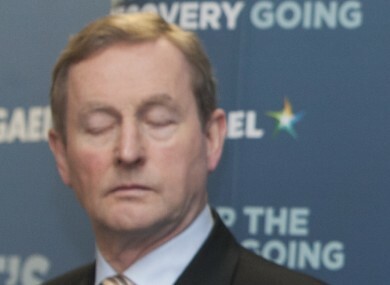 The poll for the Irish Sun shows Enda Kenny’s party down two points on its position last weekend. But most significantly Fine Gael has now fallen five points in the same tracking poll since the election started nearly a fortnight ago. Labour’s support has increased to 9% (up 1) but the combined support for the government parties of 35% leaves them well-short of the numbers needed to be re-elected with just 10 days until voting. There’s also bad news for Sinn Féin which lost the gains it made in last Sunday’s poll published in the Sunday Business Post. The party now reverts to 17% (down 3). There’s better news for Fianna Fáil, which is on 19% (up 1), and for independents who are on 18% (up 2). The Green Party is now on 4% (up 2), the Social Democrats are on 3% (down 1), AAA-PBP is on 2% (down 1), and Renua is on 2% (up 1). The poll shows that the number of undecideds is also falling with just 9% of voters left to make their mind up – that’s down 3 percentage points from the last poll. The Red C/Irish Sun poll was carried out between last Thursday and last night, but closed before 9pm – so it was taken before the RTÉ leaders’ debate. Email “With 10 days left, the latest poll is very bad news for Fine Gael ”. Feedback on “With 10 days left, the latest poll is very bad news for Fine Gael ”.